Registration for Super SIRC is now open! Want to get the latest information on all our teacher workshops? Join our mailing list! Science in the River City is an outstanding standards-based professional development program for K-12 grade science teachers. 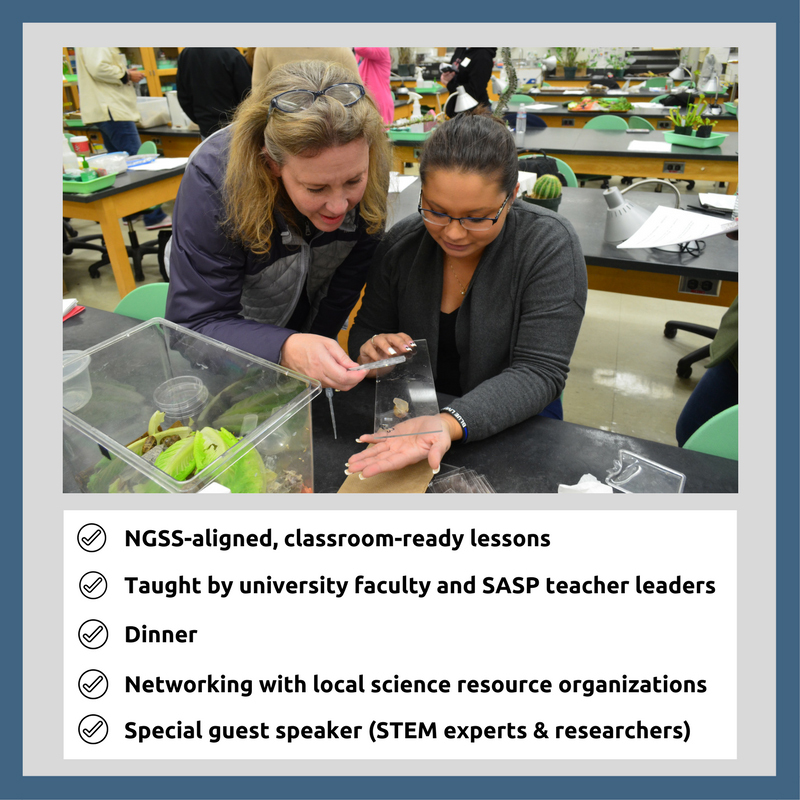 The program is designed to deepen teachers' understanding of science (through hands-on, minds-on labs and activities) and provide innovative ideas, lessons, and strategies for teachers to use in their classrooms. All workshops are aligned with the Next Generation Science Standards. Instructors are university faculty, experienced Sacramento Area Science Project (SASP) teacher leaders, and experienced science instructors. Attending SIRC will enrich your elementary, middle, or high school classroom by providing new tools and ways to think about teaching science. Super SIRC will be on Saturday, May 18, 2019. Updates and notices on workshop closures due to reaching maximum limits will be announced throughout the year on our SASP Facebook page! Cost includes dinner, parking passes, and all workshop materials. Parking: An electronic parking permit will be emailed to you a week before the SIRC event. If you have not received your parking permit by the Monday before SIRC, please call our office and we will re-email it to you. How do I pay via a Purchase Order? Note: You may be able to register online with a PO if we already have an agreement with your district! Contact Debbie Dennick for more information. Payment for credit for the fall units is due to the MASE office by the December session. Payment for credit for the spring units is due to the MASE office by the March session. Payment for credit for these units is due to the MASE office on or Super SIRC. Sign-up and details will be provided at the first meeting. You must purchase units within two weeks of the final workshop. Professional growth hours are available -- check with your district for form and conditions.